The researchers employed X-ray scattering techniques at Argonne’s Advanced Photon Source (APS), a DOE Office of Science User Facility, to monitor the nature and stability of the catalysts during the catalytic testing of the clusters in real time. 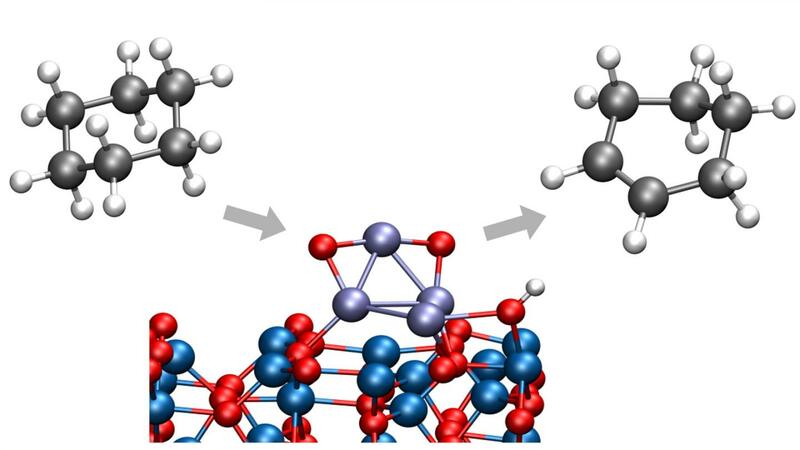 They discovered that the clusters carried out partial dehydrogenation of the cyclohexane at temperatures right around 100 degrees Celsius — far lower than had been previously observed for this kind of reaction, and the clusters retained their oxidized nature and stability at reaction temperatures up to 300°C. “The fact that we can make this conversion happen at lower temperatures protects the intermediate dehydrogenation products cyclohexene and cyclohexadiene from being further converted to unwanted products,” Vajda said. Vajda and Curtiss noted that the highly selective catalyst is long-lived and does not get poisoned or degraded by the reaction. In theoretical and experimental investigation of the size of the catalyst, the researchers found that clusters of size four and twenty-seven atoms were roughly equally efficient in carrying out the reaction. “It seems as though as long as the catalyst is below roughly one nanometer in size, this composition works well — an important factor for the potential scaleup of this class of catalysts by more traditional, though less size-selective, synthesis routes.” Vajda said. To better understand the basic mechanisms behind the activity and selectivity of the cobalt catalysts, the researchers used density functional theory calculations to model the reaction pathways. “The excellent performance of the cobalt clusters can be explained by theoretical calculations, which reveal highly active cobalt atoms in the clusters and show that the oxidized nature of the clusters causes the low-temperature formation of the product,” Curtiss explained. A paper based on the study, “Subnanometer cobalt oxide clusters as selective low temperature oxidative dehydrogenation catalysts,” was published in the February 27 online issue of Nature Communications. Other authors of the paper included Argonne scientists Sungsik Lee, Avik Halder, Glen Ferguson, Sönke Seifert, and Randall Winans. Other contributors included Detre Teschner and Robert Schlögl from the Fritz-Haber-Institut and the Max-Planck-Institute for Chemical Energy Conversion in Germany, Vasiliki Papaefthimiou from the University of Strasbourg in France, and Jeffrey Greeley from Purdue University. The research was funded by the DOE’s Office of Science and by the Air Force Office of Scientific Research.